this is part IV in the “wrong side XI” series, where i’ll be selecting my very own starting eleven, assuming of course that i could choose any player from any team in the world. you can read the rules i’ll be following to make my team selection, and what formation i’ll be squeezing them into, on the first post in the series. 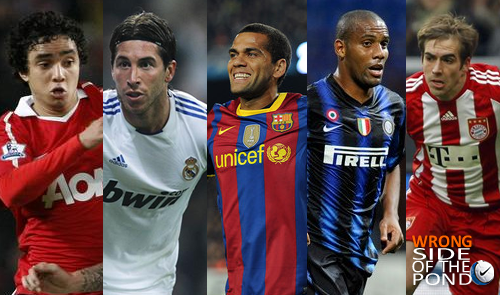 rafael, sergio ramos, dani alves, maicon and lahm do battle for my starting right back slot. Welcome back to the very exciting selection of my imaginary team! In today’s part IV of the wrong side XI series, we’ll be picking the back on right flank. If you read my last post, you got to hear all about my love for my favorite position, left back. And though today’s position is essentially the exact same position, my afinity for it is not near as high. Maybe it’s because I’m left footed, maybe it’s because I rarely played there growing up (though as i’ve played it more, I do enjoy getting to cut inside to my left). But I just don’t feel the same way that I do about right back as I do with it’s left sided counterpart. Regardless, picking a right back wasn’t actually a very difficult task. Strategically, I’m looking for the same type of player that would play on the left. He will need to be an attacking style wing back, who will get forward and provide offensive support and service, as well as being able to shut down the other team’s offensive threats. So, lucky me, there’s no need to go into specifics again. So perhaps we should get into it, right? And just as a preliminary F.Y.I. : Alan Hutton will definitively not be allowed within 30 feet of this list. i hope this isn't a picture of fábio. Here I go again with those players with potential. That rings especially true when I pick a 20 year old defender that’s only 5’8″ and has zero international caps to his name. However, I see a lot in the skill and intelligence Rafael displays at such a young age. As is normally the case with Brazilian backs, the young mop-haired defender is extremeley quick and energetic. He seems to buzz around constantly, full of energy… though I’m sure that also is a side effect of his youth. But what really sets him apart from his competition though is his ability play both ways very well. He’s a constant pest on defense, buzzing and bouncing around his mark like a swarm of gnats on a ham sandwich. Going forward, his ability to play in tight spaces and combine with the wingers in front of him makes him extremely dangerous in United’s free-flowing attack. Unfortunately for the young Samba star, he’s just not quite there yet to make it higher up this list, at least. Why? A) He has a penchant for being a hothead, and B) I’m only 74% sure that I’m not actually thinking of his identical twin brother, Fábio. though torched by bale, i've still got some love for maicon. Aside from a few nights were Gareth Bale shamed him into needing to hail a taxi, Maicon has long been considered one of the preeminent right backs in the world. Just as with his countryman above, the Inter man embodies the traditional Brazilian spirit of the wingback, attacking with flair. What separates him from most of his compatriots, however, is his size. While you’re average wingback coming out of Brazil is usually a 5’7″ to 5’10 little guy that specializes in quickness, Maicon is a strong, physically imposing specimen at just over 6′. However, as Bale taught us earlier in the season, it appears that the aging defender is starting to lose a step. Normally you could expect Maicon to be able to shackle a strong, quick player like the Tottenham winger. Yet at 29, he might just be reaching his point in decline. it wasn't easy passing over sergio ramos. Before Bale, and even before Fàbregas, Sergio Ramos was my dude. Even before his move to Madrid at aged just 19, I enjoyed watching the youngster bust up the flank for Sevilla. The Spaniard is quick, energetic, powerful, and loves getting into the attack more than any other marking back in the world (though often times, too much). He’s always flying around at 1,000 mph. And who doesn’t love a defender who’s aerially dangerous in the offensive end? Ramos is known for heading a goal in from time to time, with 25 goals in just under 200 games for the los Merengues. Unfortunately, what makes Sergio such an attractive selection is also what makes him an unattractive one. His penchant to “get in” so much makes him a liability because he leaves his fellow defenders understaffed. And with his flying-about mentality, he always seems just on the cusp of spiraling out of control… which he does from time to time. Plainly put, he can often be a big risk. Add that all up, and I just can’t take the risk of including one of my favorite players. he's just a little guy, but he's got a lot of heart. I promise that captain Phil isn’t this high in my rankings solely because he’s a converted left back. Lahm, who actually made my world cup best XI last summer, has been a starter for both Bayern and die mannschaft for quite some time now, despite being a relatively young 27. So what’s so appealing about Lahm? He’s known for having a powerful right shooting boot, something that necessitates him being high up in the offensive end at least occasionally. That at least partially proves that he’s a good fit for my style. But not only that, the understanding that he quickly developed with Dutch maestro Arjen Robben, and the combination play the two often take part in, provides me even more assurance. Thirdly, Lahm is a also tremendous defender. Although he’s a bit midget-ish for a back (standing in a full 3 inches shorter than me at 5’7″), Lahm is well known for his precise tackling ability. Reading everything above, why wouldn’t I pick him? Actually, Lahm would be an easy first choice… if it weren’t for one other player. despite recently being a big cheater, alves locks up the right back slot. Alves almost got the same treatment Ashley Cole received on my left back post after the theatrical display he put in during the first leg of the Champions League semifinal against Real. If I hadn’t written out this list well in advance, he just might have gotten the cut. Deep down though, I know I would have regretted the decision had I not choose him. Barcelona’s Brazilian is arguably the best outside back — regardless the side of the pitch — in the world at the moment. He is an embodiment of the ideal wingback and the spiritual successor to Roberto Carlos’s offensive prowess. To help prove that point, Zonal Marking recently evealed a remarkable stat where Alves was the Champions League season leader for completed passes in the offensive third of the pitch. Yeah, he’s a “defender”. He’s also a remarkably accurate passer, and is more than capable of playing in tight spaces normally reserved for midfield maestros. And as would be expected, he’s also a fantastic defender… at least when not taking dives, anyway. He’s supplanted Maicon as Brazil’s #1 right back , and has also locked up a new 5-year contract with Barça. I’d say that’s more than enough to earn him a spot in my starting XI.